State Bank of India released call letter for the pre-exam training for Junior Associates (Customer Support & Sales) And Junior Agricultural Associates. Candidates of SC/ST/Minority who had opted for the pre-examination can download call letter from the direct link provided below or from the official website. Without admit card candidate is not allowed to write the examination. State Bank of India is an Indian multinational, Public Sector banking and financial services company. It is a government-owned corporation with its headquarters in Mumbai, Maharastra and also its corporate office in Mumbai, Maharashtra. It conducts various examinations for the recruitment of eligible candidates in the various departments every year. Similarly, this year SBI released the recruitment notification for the Junior Associates in clerk. Candidates of SC/ ST and Minority who opted for the Pre-examination can download call letter from the official website. State Bank of India (SBI) is going to conduct pre-examination Training for SC/ST/Minority Candidates Junior Associates (Customer Support & Sales) And Junior Agricultural Associates in Clerical Cadre who have opted for the same at the time of registration can download the admit card from the direct link provided below. The admit card contains details regarding exam venue, roll number etc. and is the important document to carry for the examination. 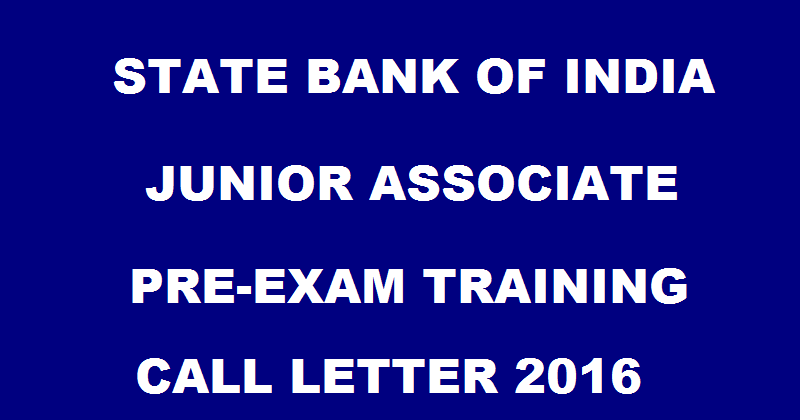 How to Download SBI JA & JAA Pre-Exam Training call Letter? Click on JA & JAA Pre-Exam Training call Letter. Stay tuned to this website. We will update SBI JA & JAA admit card, results etc. Press CTRL+D to bookmark this page for easy navigation.